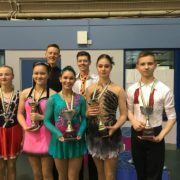 The 2019 Irish Figure Skating Championships concluded earlier today at the Lee Valley Ice Centre in London with titles up for grabs in five different categories. Sam McAllister won his first Senior Men’s title. The Ballymoney, County Antrim skater had a strong showing in the short programme where he scored 57.16 in a routine that included a triple Lutz, a triple flip-double toe loop combination, a double Axel and two Level 4 spins. He opened his free skating with a triple Lutz and went on to land triple Lutz-double toe loop and double Axel-double toe loop combinations. He earned a free score of 94.35 to give him a total of 151.51 for the gold medal. Conor Stakelum was looking to bag a sixth senior title and came very close. The Dublin native attempted a triple loop and a triple toe loop-triple toe loop combination in the short and received a score of 47.38. He rallied in the free skate to win the segment with a score of 101.66, but had to settle for second place overall with a total of 149.04. Elizabeth Golding claimed her first Junior Ladies title with an overall score of 73.37. In his first appearance at an Irish Championships, Dillon Judge picked up the Advanced Novice Men’s title with a total of 70.03. There was also a first title for Robyn Foster in the Advanced Novice Ladies category as she amassed a total of 73.54. Sophia Tkacheva came second with overall score of 61.57. After silver in 2018, Laura Hegarty took the Basic Novice Ladies title with a total score of 16.60. Full detailed results for the 2019 Irish Figure Skating Championships are available here.